Who will be finding teammates for these guys? We've all had a few days to digest Friday's bombshell announcement that Donnie Walsh was done with the Knicks. We heard from Walsh, we heard from Isiah Thomas, we heard that James Dolan asked Walsh to take a pay cut and we heard that James Dolan made it clear that autonomy was not part of his job. Ultimately, after the smoke has cleared, you're left feeling one thing about Walsh's stated reason for his end of the mutual decision. It wasn't so much that he was too old to do the job, but he was, to misquote Danny Glover, too old for this crap. He's not the type to throw the grenades at Dolan that we'd all like to see, but it doesn't take much to read between the lines. When you deal with the Isiah thing last summer, the Mark Warkentien hire behind his back during the season, the Carmelo Anthony deal and a pay cut and other role changes, it stops being surprising that Walsh is leaving and starts being surprising that he made it this long. If it were just about Walsh's inability to commit to more than one year, it wouldn't have taken this long to come to this ending. It wouldn't have taken this long if Dolan just wanted to make a move, either, so that means there had to have been some place where the two sides weren't able to come together on a working relationship. And so it is over and the Knicks must move on down the road. They need to figure out who will be leading them down that road and, until they do, it will be hard to read much into the where the road will take them. If it turns out to be some kind of combination of interim General Manager Glen Grunwald, Warkentien and MSG president Scott O'Neil, there will be reason to doubt the team's growth. Too many cooks in the kitchen, especially when one of them -- O'Neil -- isn't a basketball mind at all. 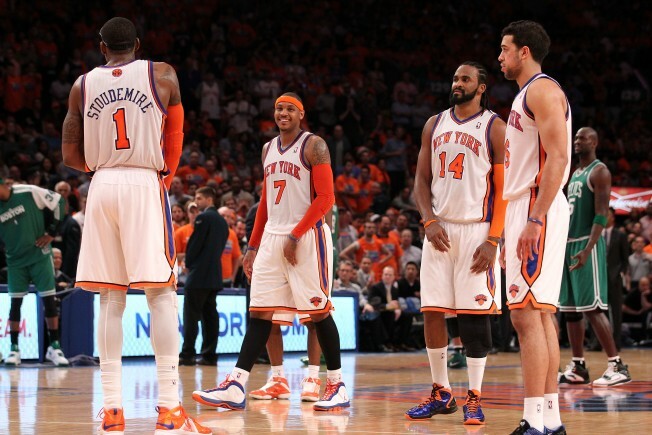 It may be silly to hope that the new Knicks G.M. is allowed to run the team without any outside interference, but that doesn't mean we can't hope for someone who actually knows how to run a basketball team. Former Blazers honcho Kevin Pritchard and ex-Hornets G.M. Jeff Bower are two such guys and, even if they loathe the idea of working for Dolan, there are only so many jobs in the NBA and getting the Knicks to the next level would do wonders for their reps.
That leap won't be an easy one to make. As well as Walsh did his job over the last three years, it can't be emphasized strongly enough that what he did was the easy part. Dumping salary and then going from awful to mediocre were major strides for the Knicks but they are strides that still left them as a mediocre team. Getting from there to the upper echelon of the league is going to take smarts, creativity and a little bit of luck. We know Walsh had the first two things. His departure will be a lot less lamentable if he's followed by someone who shares those traits.